A couple of months ago, Czech President Milos Zeman made an unusual request: He urged citizens to arm themselves against a possible "super-Holocaust" carried out by Muslim terrorists. Now, according to The Washington Post, the country's interior ministry is pushing a constitutional change that would let citizens use guns against terrorists. Proponents say this could save lives if an attack occurs and police are delayed or unable to make their way to the scene. To become law, Parliament must approve the proposal; they'll vote in the coming months. Unlike here in the United States, were the Department of the Interior is the federal land manager, in most other countries the “interior ministry” is the government’s internal security apparatus, so this is the equivalent of the Czech FBI and ICE proposing a new law to give immunity to those who shoot terrorists. The Washington Post says the Czech Republic already has some of the most lenient gun policies in Europe. It's home to about 800,000 registered firearms and 300,000 people with gun licenses. As of now, obtaining a weapon is relatively easy: Residents must be 21, pass a gun knowledge check and have no criminal record. By law, Czechs can use their weapons to protect their property or when in danger, although they need to prove they faced a real threat. This puts the country at odds with much of Europe, which has long supported much more stringent gun-control measures. In the wake of the 2015 terror attacks in Paris, France pushed the European Union to enact even tougher policies which have not stopped Muslim terrorists from continuing their attacks in France and elsewhere. 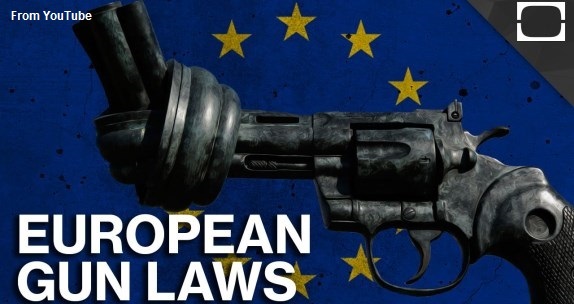 The European Commission's initial proposal called for a complete ban on the sale of weapons like Kalashnikovs or AR-15s that are semi-automatic versions of guns intended primarily for military use. The proposal also limits ammunition magazines to 20 rounds or fewer. The Czech Republic came out hard against the directive. Officials warned — somewhat ominously — that the measure would limit the country's ability to build "an internal security system" and make it nearly impossible to train army reservists. And a total ban on military-style rifles that can fire large numbers of rounds would make illegal thousands of weapons already owned by Czech citizens, potentially creating a black market for terrorists to exploit. It is also worth noting that the Czech Republic is home to the highly regarded Česká zbrojovka a.s.(PLC), manufacturers of the Škorpion vz. 61 submachinegun and the CZ 75 family of pistols. The ČZUB factory employs some 1800+ engineers, craftsmen and business personnel, making it one of the largest firearms manufacturers in the world. CZ 75 pistols are sold in the United States and are ranked with the top service-type semi-automatic pistols, such as the Glock 17, Heckler and Koch and Sig Sauer offerings. Unfortunately for the people of the Czech Republic, after months of contentious negotiations, the EU passed a “compromise” last month; the Council of Ministers will confirm the measure this spring. The “compromise” says all member states will have 15 months to comply with the new gun restrictions. The final measure bans the sale of most military-style rifles and requires all potential buyers to go through a psychological check before they can buy a weapon. If someone fails a check in one E.U. state, that information will be shared in an international database so that the person can't procure a gun somewhere else. Online sales are also severely curtailed. The Czech Republic was the only country to oppose the directive for being too strict. That means that regardless of how the Czech parliament votes on the terrorist-hunting measure, gun laws in the Czech Republic are going to get stricter. All gun purchasers will be required to pass the as yet undefined psychological checks, and it's not yet clear if gun owners will have to turn in newly illegal weapons. Fortunately, here in America we have the Second Amendment to the Constitution to protect us and our God-given right to keep and bear arms and no globalist “Council of Ministers” can take it away. Submitted by rosugill on Thu, 06/08/2017 - 10:35. The last paragraph in the above article is only valid if we the people in the United States of America are willing to fight our own Government to force them to respect out Constitution in order that we be able to remain a free country. The past eight years should be illustration enough to show anyone with a brain that the socialist/communist/Nazi portion of our Government that refers to themselves as liberals or Democrats (LOL) that there are those there that want to tear up our Constitution and rule us rather than govern as the Constitution sets out.